Anne Gordon de Barrigon is a whale and dolphin expert. 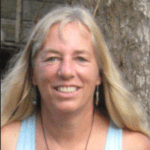 She has been running Whale and Dolphin Wisdom Retreats since 2007 and has a degree in biology and animal behavior. She has worked as a zookeeper and has trained animals for over 20 years for movies and TV. Married into the indigenous Embera tribe in Panama, Anne Pioneered the whale watching industry in Panama. She owns and operates Embera Village Tours where she shares her passion for whales and dolphins with visitors from all around the globe. I think that would be the whales and dolphins. For me they're my gurus.